"Steam Trains on the Columbia"
The Spokane, Portland & Seattle's 700 (SP&S 700) steam engine is one of the few remaining steam locomotives still operating in North America. The SP&S 700 was built in 1938 by the Baldwin Locomotive Works and was delivered to the SP&S on June 21, 1938. The 700 originally pulled passenger trains between Portland, Oregon, and Spokane, Washington, including the famous "Empire Builder", In 1947 the "Empire Builder" went to diesel. Once diesel took over the SP&S 700 hauled freight. In 1955 the SP&S 700 was mothballed and in 1956 she was retired. In 1958, sparing the scrapheap, the SP&S 700 was donated to the City of Portland for a porposed rail museum. The engine was displayed at Portland's "Oaks Park" for nearly 20 years, along with two other stream engines, the Southern Pacific 4449 (SP 4449), and the Oregon Railway & Navigation Company's 197 (OR&N 197). For many years the three engines resided at Portland's Brooklyn Roundhouse, a four-stall roundhouse built in the 1940s to accommodate the larger size of the newer more powerful steam locomotives, located in the former Southern Pacific Brooklyn Yard. In 2012 the Oregon Rail Heritage Center opened along the Willamette River and on June 26th, the three engines were moved to their new home. On January 25, 2006, the SP&S 700 locomotive and tender was added to the National Register of Historic Places (Event #05001557). The SP&S 700 was listed as a working example of the peak of steam and rail technology of its era. Source: Oregon Heritage Foundation website, 2006. The Southern Pacific's 4449 is the only remaining example of twenty-eight GS-4 Daylight Class steam engines constructed in 1941, designed to pull the Southern Pacific's famous "Daylight" trains between San Francisco and Los Angeles. The SP 4449 escaped the scrap pile and became famous as it pulled the Bicentennial American Freedom Train around the United States in 1975 and 1976. During its two-year tour of duty it was seen by an estimated 30 million people and traveled through 41 states on 28 different railroads from Washington State to Florida, making it the most famous locomotive in the country. In September 1999, the Southern Pacific "Daylight," the train 4449 was built to pull, was commemorated on a U.S. Postage Stamp. Source: Oregon Rail Heritage Foundation website, 2006. "Steam Locomotive No. 844 is the last steam locomotive built for Union Pacific Railroad. It was delivered in 1944. A high-speed passenger engine, it pulled such widely known trains as the Overland Limited, Los Angeles Limited, Portland Rose and Challenger. Many people know the engine as the No. 8444, since an extra '4' was added to its number in 1962 to distinguish it from a diesel numbered in the 800 series. The steam engine regained its rightful number in June 1989, after the diesel was retired. When diesels took over all of the passenger train duties, No. 844 was placed in freight service in Nebraska between 1957 and 1959. It was saved from being scrapped in 1960 and held for special service. Hailed as Union Pacific's "Living Legend," the engine is widely known among railroad enthusiasts for its excursion runs, especially over Union Pacific's fabled crossing of Sherman Hill between Cheyenne and Laramie, Wyoming." Source: Union Pacific website, 2009. 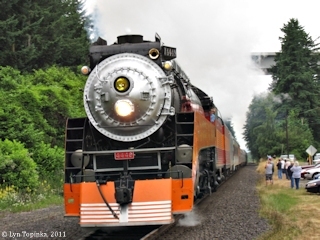 On July 2 and 3, 2011, the "Friends of SP 4449" operated two 200-mile all-day round-trips through the Columbia River Gorge between Portland, Oregon, and Wishram, Washington, with net proceeds to be used by the Friends to pay for the 15-year federally mandated tear down and examination of the engine. When completed, engine 4449 will be good for another 15 years of excursion service. Each train was equipped with coach, club, and dome cars. It also included a BBQ lunch for each rider in Wishram. 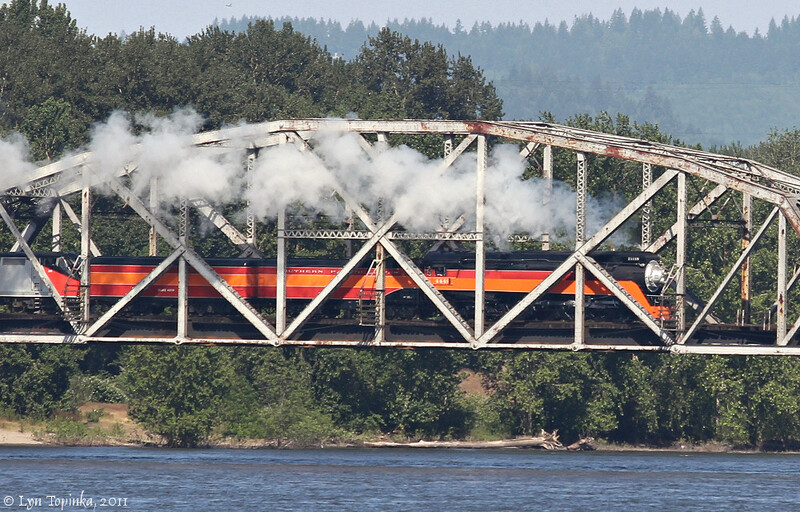 Click image to enlarge SP 4449 Steam Engine, crossing the Columbia River, Vancouver Railroad Bridge. View from Vancouver Landing. Image taken July 2, 2011. 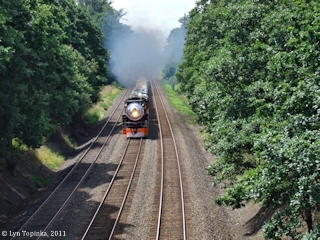 Click image to enlarge SP 4449 Steam Engine, eastbound passing the Vancouver Trout Hatchery, Vancouver, Washington. Image taken July 3, 2011. 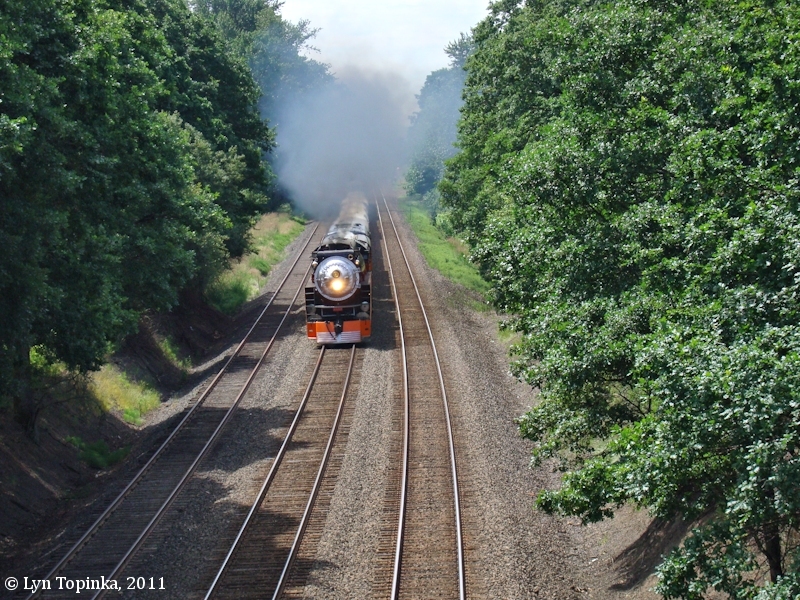 The Southern Pacific 4449 left Portland, Oregon's Union Station around 11:00 a.m. on June 21, 2011, heading north to Tacoma, Washington. Click image to enlarge SP 4449 Steam Engine, heading north to Tacoma, as seen approaching the walking bridge, Carty Unit, Ridgefield NWR. Image taken June 21, 2011. The Southern Pacific 4449 left Portland, Oregon's Union Station at 8:00 a.m. on July 3, 2009, heading to Owosso, Michigan, for "Train Festival 2009", America’s largest celebration of railroading. "Train Festival 2009" featured eight steam locomotives under steam, vintage and modern diesel and electric locomotives, various train rides, huge model train layouts, miniature train rides, art exhibit, locomotive cab tours, railroad vendors and much more. The SP 4449 returned to Portland on October 20th. Click image to enlarge SP 4449 Steam Engine, arriving Fisher's Landing, Washington, Columbia River. Image taken October 20, 2009. The Southern Pacific 4449 left Portland, Oregon, at 8:00 a.m. on July 3, 2009, heading to Owosso, Michigan, for "Train Festival 2009", America’s largest celebration of railroading. "Train Festival 2009" featured eight steam locomotives under steam, vintage and modern diesel and electric locomotives, various train rides, huge model train layouts, miniature train rides, art exhibit, locomotive cab tours, railroad vendors and much more. The SP 4449 was photographed with the Columbia River in the foreground and the massive basalt cliffs of Cape Horn as a backdrop, at RM 132. 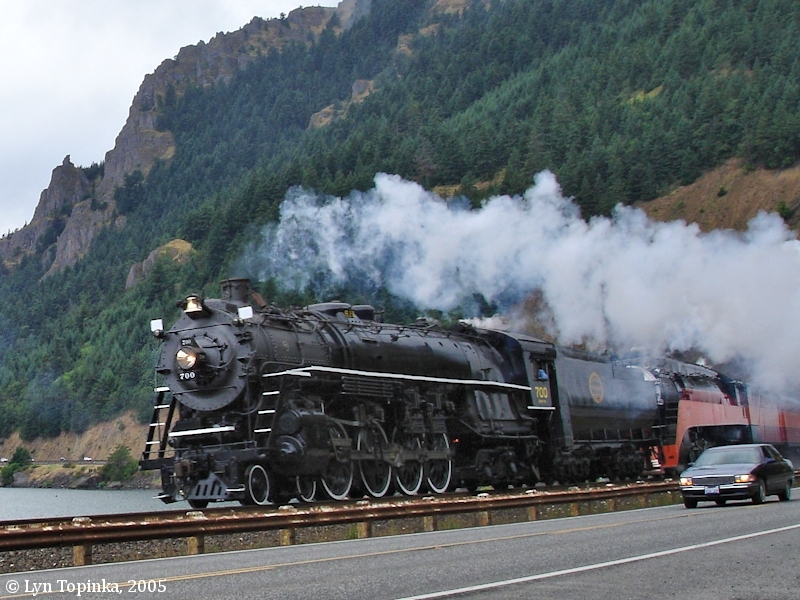 Click image to enlarge SP 4449 Steam Engine below the cliffs of Cape Horn, Washington, Columbia River Gorge. Image taken July 3, 2009. 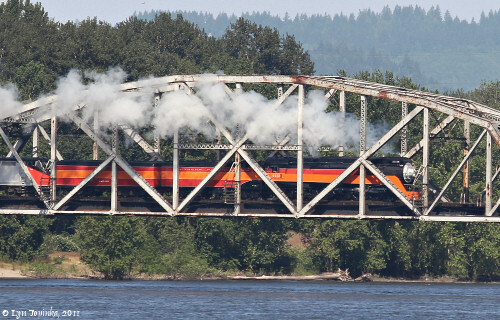 The SP 4449 is shown leading the UP 844 as they cross the Lewis River Bridge, at Columbia River Mile (RM) 87.5. The two steam engines were on their way up to Tacoma, Washington, for a "Puget Sound Excusion", running round-trip from Tacoma to Everett on May 18 and 19. Click image to enlarge Southern Pacific 4449 followed by the Union Pacific 844 crossing the Lewis River near the junction of the Lewis with the Columbia. Image taken May 12, 2007. 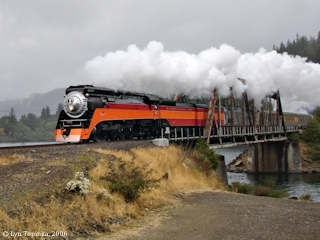 The September 16, 2006 excursion of the SP 4449 was sponsored by the Northwest Rail Museum, and was a round-trip -trip from Portland to Bend. Views of the SP 4449 were taken as it crossed the Wind River bridge, at RM 154.5. 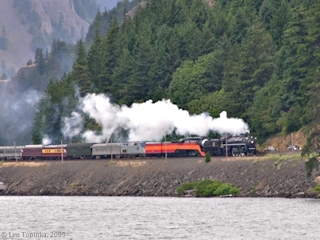 The SP&S 700 and SP 4449 Excursion, July 6, 2005, was viewed from Dog Creek, Washington, at Columbia River Mile (RM) 160. The National Railway Historical Society sponsored the round-trip excursion from Portland, Oregon, to Wishram, Washington, and return.